Alan, I went to a food symbol site, and I still think the U NO is an old Orthodox Union symbol, stating the product to not be kosher, used prior to the current U in a circle, and way before the contemporary circle with a line through it for "Not". Could be, but that was many years ago, and I don't know if that standard was adhered to at that time. Scott, I don't believe so. For a U to have to do with dietary restrictions, i.e. kosher, it would be in a circle, the logo of The Union of Orthodox rabbis. I believe the U and No were references to religious diet restrictions. This company had a bakery (factory) in Wyoming Michigan, through the 1980's. From 19082-1984, I worked for the company that provided security for them, and worked one shift there as a sub for someone that called in sick. My main post was at the UPS HUB 1/4 mile a way. I was talking about Kit-Kat's with a friend and told him we had something called "Dutch Twin" chocolate covered wafers back in my day (1960's to 1970's) . I remember them in a Yellow Box with a clear "window". I remember them being soooo delicious ! I did a Google search and found this website. *** Can't wait to explore this website !!!! Flatbush to Brownsville to Springfield Gardens then north to Westchester !! Wow, does this bring back memories! I remember that under the pictures of the Dutch Twins were the words, "u" and "no." I thought it was the kids' names! I still wonder what it meant. My family loved these; each box had 2 or 3 layers of wafer sticks, and we could easily finish half a box in one sitting. 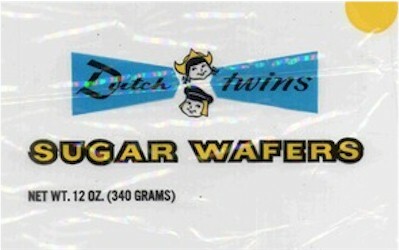 I finally located a photo of the Dutch Twins logo I remember, but the chocolate wafers came in a yellow box, and I'd love to find a photo of that. Heck, I'd love to find a box on the supermarket shelf!